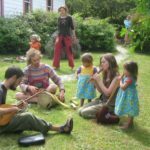 36:17 – First portion of this episode is a folk jam session at a spring celebration by a band called A Tiny Window in 2006. Second portion is a collection of songs that were popular in 1906, one hundred years earlier. This entry was posted on Wednesday, April 4th, 2018 at 9:03 pm and is filed under Apr18, Shambles. You can follow any responses to this entry through the RSS 2.0 feed. You can leave a response, or trackback from your own site.